25th Anniversary of Diplomatic Ties: Did Beijing Give Seoul The Cold Shoulder? China and South Korea celebrated the 25th anniversary of diplomatic ties without fanfare. August 24 marked the 25th anniversary of the establishment of diplomatic ties between China and South Korea. Since the establishment of formal diplomatic relations in 1992, both countries have been jointly celebrating the anniversary every five years. In particular, during the 15th and 20th anniversaries, China and South Korea co-held grand joint events together to highlight the strong bilateral ties. However, this year’s atmosphere got a little awkward: although both countries still celebrated the anniversary, no joint events were held. Instead, China sent its science and technology minister to a South Korean embassy event in Beijing. It was the Chinese side that initiated to hold events separately this year. According to The Chosunilbo, the Chinese People’s Association for Friendship with Foreign Countries (a Foreign Ministry agency), informed the South Korean Embassy about China’s decision, just three days after South Korea approved the provisional deployment of additional THAAD launchers. When being asked about this decision on August 21, China’s foreign ministry spokesperson Hua Chunying claimed she was “not aware of the detailed arrangements.” Furthermore, she noted: “We hope that the ROK can take seriously the reasonable and legitimate concerns of China on relevant major issues and take constructive actions to promote the mutual trust between the two peoples and the growth of bilateral relations.” Her comment has been interpreted as a veiled reference to the deployment of THAAD anti-ballistic missile defense systems in South Korea. On August 24, the South Korean Embassy threw an anniversary party at a hotel in Beijing. Yet, the highest-level official China sent was Wan Gang, the science and technology minister and vice chief of Chinese People’s Political Consultative Conference, a parliamentary advisory body. Wan’s position is considered a vice premier-level position, though he might not necessarily have vice premier-level power. In addition, Wan is the Chairman of the China Zhi Gong Party, a legally sanctioned minor political party in China. The Chinese national newspaper People’s Daily just used one short sentence to report Wan’s attendance. Other Chinese media outlets didn’t even bother to report it at all. “Customarily, events marking every 10th year tend to be more magnificent,” an official of Seoul’s foreign ministry explained to Yonhap News Agency. In comparison, when both countries held joint events to celebrate the 20th anniversary in 2012, then-Chinese Vice President Xi Jinping and Foreign Minister Yang Jiechi attended the embassy event amidst ample media coverage. Despite the apparent cooling down of bilateral relations, China didn’t completely give up its old tradition of exchanging congratulatory messages on the anniversary. 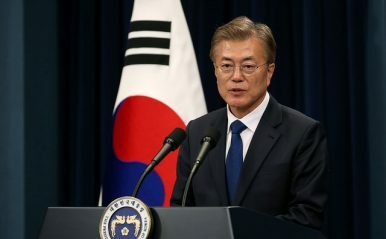 Chinese President Xi Jinping sent his congratulatory message to his South Korean counterpart, Moon Jae-in, saying that he is ready to make concerted efforts with Moon to properly address the differences between the two countries. What’s Next for South Korea’s Moon Jae-in in 2018? Given that little about what is occurring is new, here is a cliché-ridden assessment of what lies ahead for him.